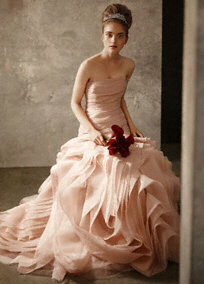 Something Old, New, Borrowed, PINK? Reese Witherspoon wore a pink wedding gown for her recent nuptials at her California estate home.When I saw this celebrity style update while browsing entertainment news online, it made me wonder about the power of celebrity trends for what is usually a very tradition-oriented day. Nobody can deny the overwhelming public interest in celebrity styles and trends. Will Reese’s dress color choice make brides want to wear “Something old, something new, something borrowed, something PINK?” for their own upcoming nuptials? Pink is a commonly selected color for weddings, whether for the bridesmaid dresses, table decorations, wedding invitation accents, or bouquets. Pink is undoubtedly the color of romance and particularly suited for a spring or summer wedding event. Thinking more about the possible pink gown trend that has just been sparked, I searched some wedding gown websites and checked out the new collections. For a newly engaged bride-to-be, her wedding gown may be one of the first details to research and pin down as she starts her wedding planning process. It’s surely one of the most enjoyable details for most brides. Most brides purchase their wedding gown at least 9 months to 1 year before their wedding date, so maybe next summer you’ll attend the wedding of a rose-clad bride, maybe thanks to Reese. 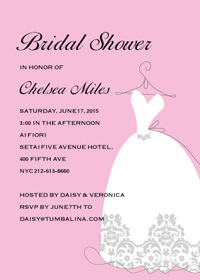 We have a beautiful selection of pink (and other color) wedding invitations at LookLoveSend. Join our mailing list and receive 20% off your first order.